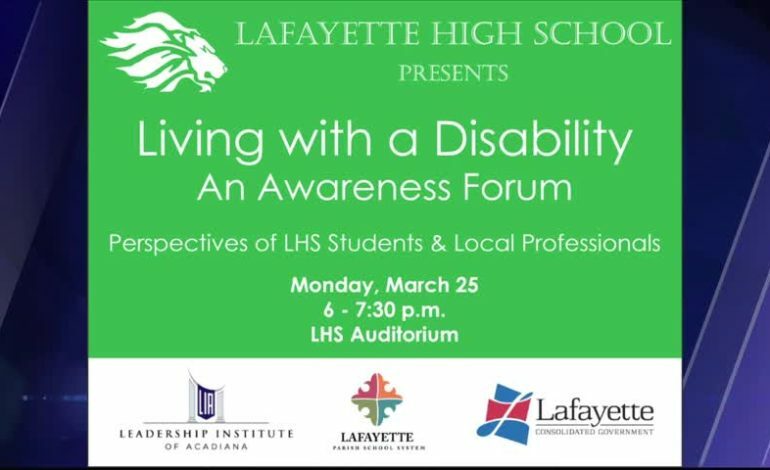 Lafayette High School (LHS) and Lafayette Parish School System (LPSS) are partnering with Lafayette Consolidated Government (LCG) and the Leadership Institute of Acadiana (LIA) to host a Disability Awareness Forum. The forum will offer insights into what it is like to be a high school student with a disability and the unique challenges they face. This event was spearheaded by an LHS student with a disability who wanted to express how his life is different to his peers. The forum will be moderated by Ashley Mudd Executive Director of LIA. The panel will consist of current LHS students, parents of students with special needs and industry professionals such as Liam Doyle Disability Awareness Coordinator for LCG and Bart Thibodeaux Director of Special Education for LPSS. In addition to the forum, Lafayette High will be hosting local agencies that work within Lafayette’s disabled community for a showcase of their services provided. Agencies in attendance include: Families Helping Families, Down Syndrome Association of Acadiana, Louisiana Rehabilitation Services, Autism Society Acadiana and many more. Events that engage our local disabled community are essential for not only moving Lafayette Parish forward but also to educate the next generation on issues facing those with disabilities. Please join the conversation on March 25th at LHS for this free and informative event.